This glove is really of masterful execution without any compromise. 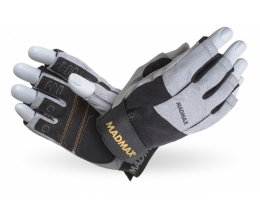 The glove is made from high-class black leather in matte modification. Its inside part is equipped by special lamination, which prevents from coloring the hands when training. 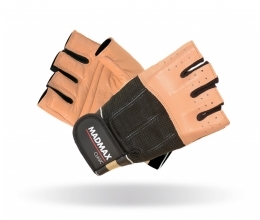 In the field of the back of hand and fingers, that are mostly deformed by using, the leather is discontinued and lined by fine Lycra that increases the flexibility and prevent from leather’s deformation (Flex & Fit). 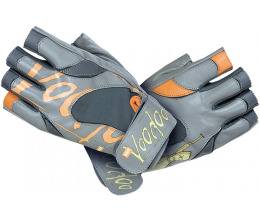 The field among the fingers and the back of palm is made from a very strong, elastic and aerial 4-way Lycra. The loop is made from strong cotton belt that is more strong about 1“ in the field of the back and enables to clip the glove precisely not only in the field of palm but also on the back. By this it is ensured that the gloves „fit“ exactly each hand. Velcro ends the loop. In the field of palm an especially modified leather is used, very resistant against mechanical stress. The field of palm is lined moreover with special spume material, divided into individual segments. This material ensures absolutely precise handle its stitching and dividing into segments prevents then from moving the leather in the field of palm.